Read last month's Geotimes presidential election poll results. What is the primary source of your winter heat? How do you think your heating costs this year will compare to last year's? Large release of natural gas from ice-like structures located on the seafloor may have played an important role in global change millions of years ago. With natural gas prices on the rise, many researchers are looking into the potential of making gas hydrates, both onshore and offshore, a viable resource. So they may be a future energy resource and indicators of past climate change, but how do we find them? Could giant bubbles of gas released from the seafloor be responsible for the infamous disappearances of ships and planes in the Bermuda Triangle? One geologist took her work to the next level  bridging both cultural and scientific gaps between students in Nepal and the United States. An undercover agent for NASA recounts his experiences tracking down both bogus moon rocks and real moon rocks smuggled out of the countries that own them. The thousands of observation platforms monitoring the worlds oceans, land and air, need to join together as a system of systems. Vice Admiral Conrad C. Lautenbaucher Jr.
dollars is more complex than it may seem. From war to the SATs, modern pencils have a fascinating history that dates back some 500 years. Sometimes called "fire in ice," methane hydrate, shown here sustaining its own combustion, is one of a group of gas hydrates that consist of light natural gases trapped in ice-like cages. Some researchers think the hydrates played a role in past climate change, and others are looking into their potential as a source of energy. 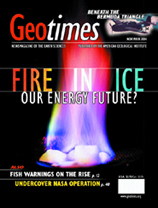 Read more about hydrates throughout the issue. Photo by J. Pinkston and L. Stern/U.S. Geological Survey. Upper right: Five Navy Avengers similar to those shown here disappeared in the Bermuda Triangle on Dec. 5, 1945, during a routine training mission. Read about scientific investigations into the Bermuda Triangle. Photo courtesy of the Naval Historical Foundation.